A humpback whale breaches off the coast of Long Beach, Calif., in 2015. Most populations of humpback whales no longer need endangered species protections, according to a decision by the National Marine Fisheries Service. The U.S. government listed all humpback whales as endangered back in 1970, after commercial whaling had drastically reduced their numbers. 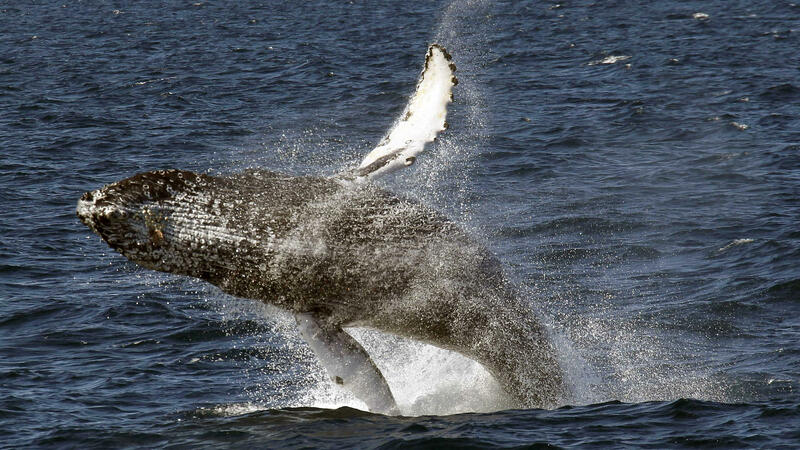 But now, officials say they have divided humpback whales into 14 distinct populations. And after a scientific review, they say that nine of those populations have recovered enough that they no longer need to be considered endangered. "We believe that we have conducted a very thorough scientific assessment," says Angela Somma, chief of the endangered species division at the agency, also known as NOAA Fisheries. "Most of the humpback populations have increased and increased substantially from where they were." Whales that are still considered endangered include populations in Central America, off northwest Africa, in the Arabian Sea and in the western north Pacific. And a population near Mexico is listed as threatened. Whales from the Central America and Mexico populations travel through U.S. waters at certain times of year as they feed in areas off the West Coast and Alaska. As a practical matter, little will change for the whales — they'll still be covered under the Marine Mammal Protection Act, she notes. And the International Whaling Commission's moratorium on hunting these huge ocean creatures, which was imposed in 1982, remains in effect. "Many of the day-to-day protections and activities will continue to occur," Somma says. For example, officials have filed regulations to ensure that vessels around Hawaii and Alaska continue to maintain a safe distance from the whales. Collisions with ships are a danger to the whales, and they face other threats, such as getting tangled up in fishing gear. The Center for Biological Diversity, a conservation group, said nearly 40 reports of whales becoming entangled were recorded off the West Coast in the first half of this year.